For this particular drink there isn't a crowd friendly option, but you can easily serve either lemonade (pink if you want to match this drink) or just pink grapefruit juice for the smaller ones. For the outside table we added lemon slices to the children's lemonade with cute paper straws and it was just darling. I have been craving all things citrus with the weather warming and for this cocktail I started with really good grapefruit juice. I love Natalie's juice, it is the closest thing to fresh squeezed I have found. The beautiful pink color of this cocktail paired with the other yummy ingredients in the Easter Elderflower Cocktail is so delicious. 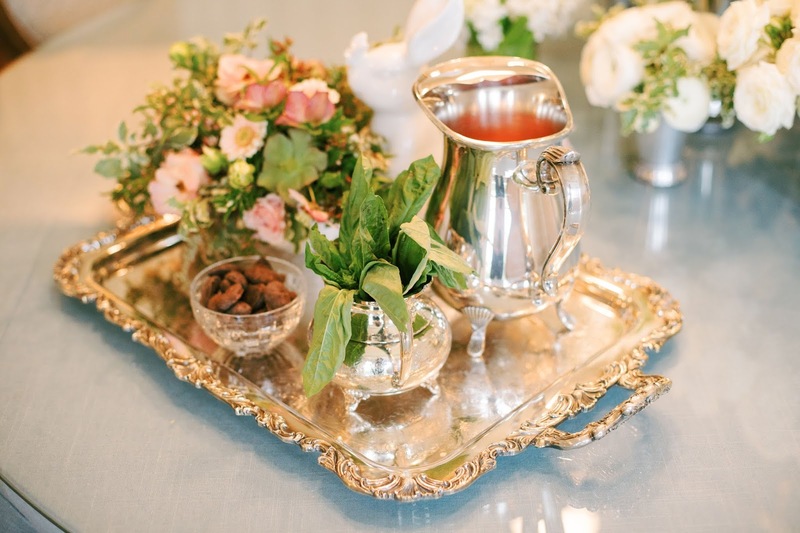 We served the cocktail in one of Mary's beautiful silver pitchers on the fabulous silver platter she uses to display her silver tea service. 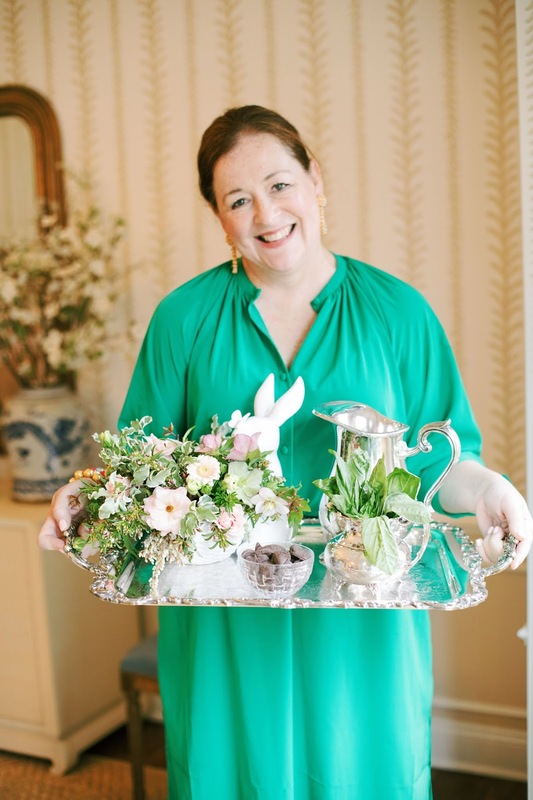 When serving drinks on a platter I like to add in garnish in a small vase or a mint julep cup + a small vase of flowers + a treat (either sweet or savory). 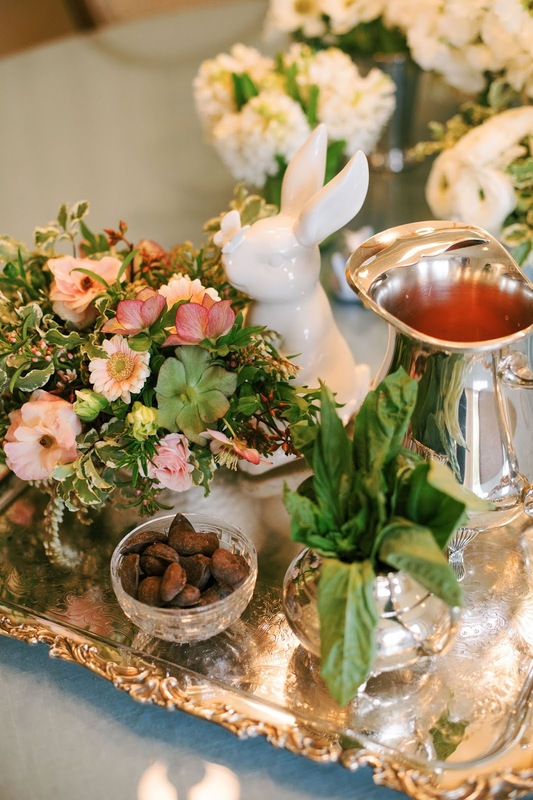 For this specific tray I chose one of the amazing bunny arrangements from the children's table, added a bowl of chocolate covered pecans and topped it off with a silver sugar bowl of basil for garnish. It looks amazing, is super functional and comes with a sweet treat. Is there anything else you need to make a signature cocktail even more fabulous? To make the Easter Elderflower Cocktail ... mix together 6 cups of Natalie's Grapefruit Juice, 2 cups of Cathead Honeysuckle Vodka, 1/2 cup of Elderflower Liqueur (more to taste if you prefer) and a couple splashes of simple syrup. I prefer mine on the tart side, but others may prefer it on the sweeter side. Garnish with a slice of pink grapefruit + a sprig of basil. I also love mine served over crushed ice but any size ice in an ice bucket next to the platter is perfect. I prefer Cathead Vodka for all my vodka cocktails and the Honeysuckle is simply delicious. 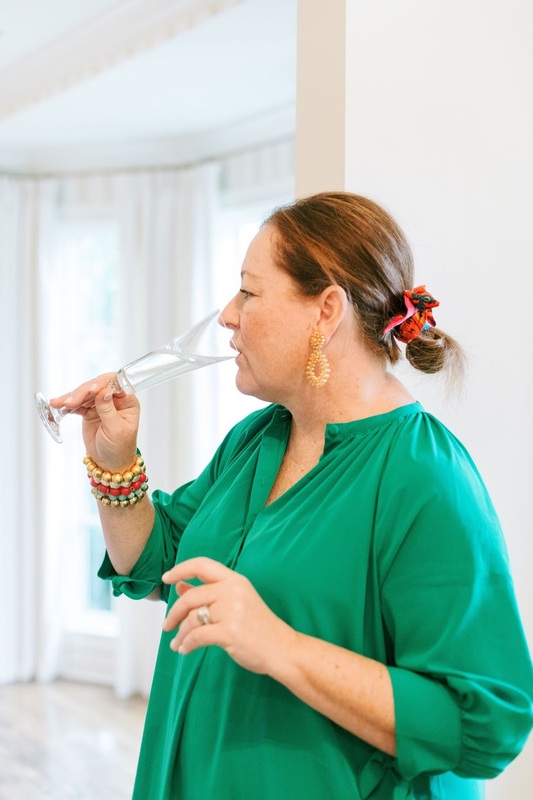 You can serve cocktails when your guests first arrive and then switch to wine for the seated meal or you also serve cocktails after eating while sitting and visiting. I love to do both but do find it is easier for me to serve them before and then just relax and enjoy my guests after we eat. 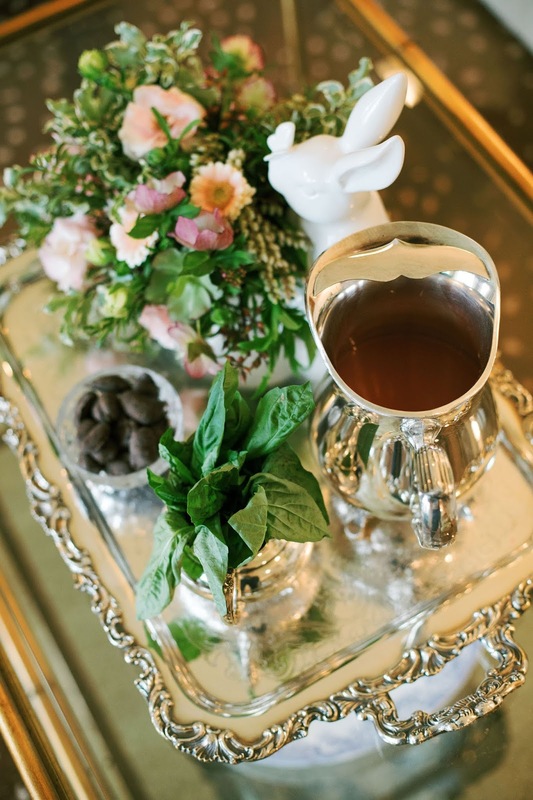 Making cocktails in bulk and either serving them in a pitcher or a decanter allows your guests to serve themselves. As Mary would say ... delegation at its best. 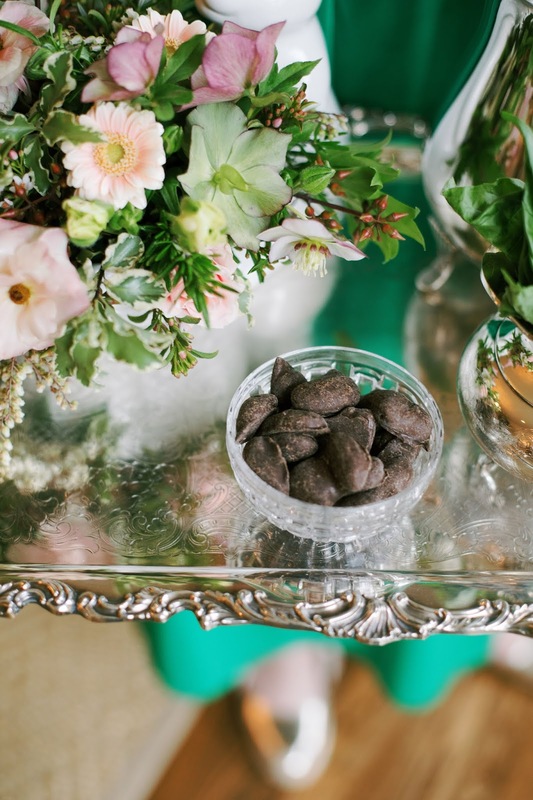 Bookmark this post for Easter or for your next cocktail hour. It is such a yummy drink and loved by all and it is perfect during the spring and summer. I am currently craving one for happy hour today. What a perfect way to celebrate Friday and the fabulous weekend of birthday celebrations we have planned. This cocktail is so delicious and perfect for serving to your guests for your next happy hour or to add to your Easter menu. I love the mixture of the freshest grapefruit juice with elderflower liqueur a touch of honeysuckle and the contrast of basil. It is truly so yummy! Mix together all cocktail ingredients in your pitcher and give it a good stir. You can taste it to decide it you wish to add extra simple syrup. Serve over crushed ice (my favorite) in an ice bucket next to the pitcher. 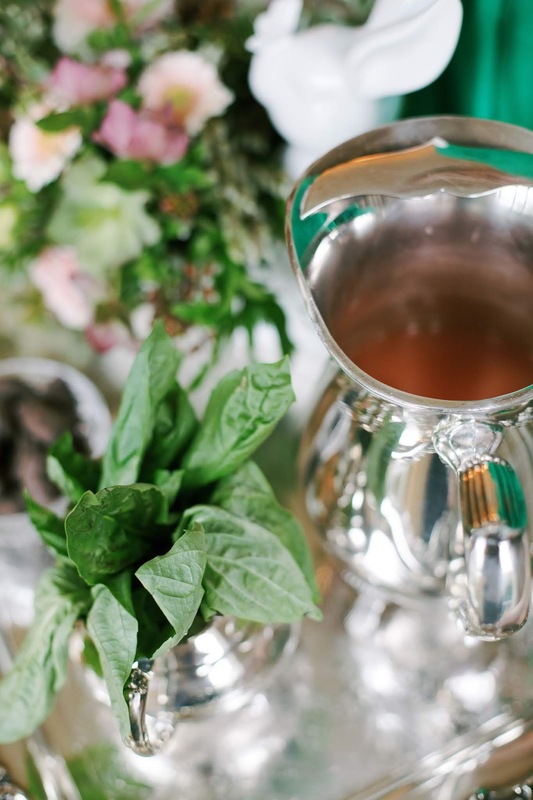 Garnish each drink with a slice of pink grapefruit + a sprig of fresh basil. Add extra grapefruit slices in a pretty bowl and extra basil in a small cup or vase of water.